On my trip to Italy last fall, I visited the Sacro Speco (Sacred Cave) of St. Benedict in Subiaco. 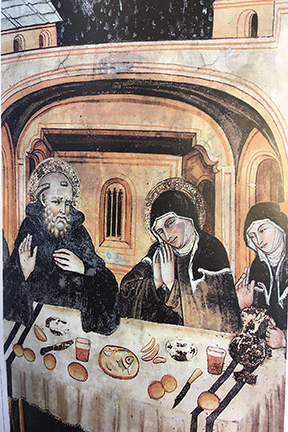 One of the frescoes in the church depicts the meeting between Benedict and Scholastica. I had seen it on a holy card, but to see it in person was touching. St. Scholastica is a model of trust for me. She trusted that God would hear her prayer. She also models the importance of relationships and time spent with those who are special to us. She so valued her time with her brother that she just couldn’t let it end. Life is busy but it should never be too busy to not give time to those we love. The older I get, I realize that visits with family and friends cannot be taken for granted. May the spirit of St. Scholastica bless our time with those we love.